In returning PRI to power, Mexicans put faith in young democracy (+video) ~ ESCRITORES POR EL MUNDO . 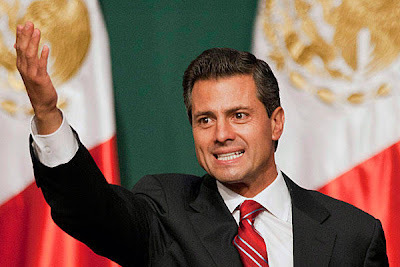 Enrique Peña Nieto won Sunday's presidential vote, returning the Institutional Revolutionary Party, or PRI, to office. Mexicans are betting their democracy is strong enough to warrant giving the once-authoritarian party another chance. After falling in 2000, the party that ruled Mexico for 71 years consecutively, the Institutional Revolutionary Party (PRI), is back in power. It's a barometer of Mexicans' faith in their democracy: the once-authoritarian party, they believe, is today best positioned to bring back stability – and must govern under new checks and balances. How much do you know about Mexico? Take our quiz. Its candidate, Enrique Peña Nieto, won Mexico's presidential election by about a five-point margin, according to preliminary counts, beating Andres Manuel Lopez Obrador of the leftist Party of the Democratic Revolution (PRD) and Josefina Vazquez Mota of the right-leaning, ruling National Action Party(PAN). "Mexicans have given our party another chance. We are going to honor it with results," said Mr. Peña Nieto, a former governor of the State of Mexico, late Sunday night. By a comfortable margin, Mexican voters seemed willing to risk that the future of their country could come to resemble its past – when the PRI kept relative stability with an authoritarian grip, handing out favors in return for loyalty, winning elections by rigging votes. The reasons that Mexicans are willing to take such a bet after their long march from authoritarianism are contradictory. Some believe the party, with its youthful candidate, has changed; some don't believe in any political class but think the PRI is the best that they've got. But most Mexicans appear willing to trust their democracy: They might not be sure what the PRI will do once it's in office again, but they do believe that in the 12 years since it has been out, society has changed in dramatic ways. The president no longer holds vast powers. With the opening of its economy, Mexico has also had to open its political system. And from a stronger federal electoral institute to the presence of influential civil society organizations, there is no way the party can get up to its old antics, they say. The PRI “won’t be able to go back to business as usual,” she adds. One of the biggest sources of power for the PRI came from its ability to control the vote. In 1988, the party was widely accused of having rigged the elections, after a leftist candidate was coming out front. But in the wake of the outcry the government began the process of overhauling its electoral system, reforms that were strengthened throughout the 90s. By the time the PRI lost in 2000 for the first time, Mexico's Federal Electoral Institute (IFE) was considered one of the world's best. The confidence in the electoral body was tested after Mexico's last presidential election in 2006, when Mr. Lopez Obrador, in his first presidential bid, declared fraud and refused to recognize election results, after losing the race by less than a percentage point. And the feeling that the election was “stolen” is still strong among Lopez Obrador's supporters. While Peña Nieto is the clear winner, the victory margin was not as high as the 10- to 15-point lead most surveys had indicated throughout the campaign. Another accountability mechanism similarly emerged in a way that cannot be turned back: civil society. In fact, the Mexican civil organizations that pushed for democracy are now celebrating their silver anniversaries. Business groups are increasingly acting as civic watchdogs, pressing for greater transparency and accountability in government. Human rights groups have proliferated: The Human Rights Network boasts more than 70 member groups in 22 states; 10 years ago, there were fewer than 50, says Ms. Meyer. Meyer points to Alianza Civica, one of Mexico’s longest-standing democracy organizations and business-backed organizations such as Mexicans United Against Crime.Newcomers like the peace movement headed up by poet Javier Sicilia and the recent student movement, #YoSoy132, which arose to protest what it called media bias in the positive coverage of Peña Nieto, have re-energized Mexican society around efforts to curb violence, reduce official corruption, and increase transparency. The PRI emerged in the wake of the Mexican Revolution and ruled Mexico as a single party from 1929 until 2000, a period famously dubbed “the perfect dictatorship.” Mexicans rejoiced when the PAN won the vote in 2000 but after 12 years in power, voters are disillusioned with slow economic growth and the brutal drug violence that has taken over 50,000 lives since Mexican President Felipe Calderon of the PAN took office six years ago. Still others fear that progress will be reversed with the PRI in government. Carlos Aviles, who works in the lighting industry, cast his vote for the PAN, he says, as the only way to bring the country forward. “The PRI in power will be a return to the past,” he says, "because after all it's the same people in power." One can't fault Mexicans for skepticism. Power is concentrated in a few hands. Mexico is hampered by oligopolies throughout the private sector. The television industry is concentrated in two main hands. Their coverage of Peña Nieto has been glowing, and even though #YoSoy132 rose to protest that, in many ways old narratives emerged. The PRI initially discredited the students, and then Peña Nieto refused to participate in a debate the movement organized, reflecting historical practices, says Hector Castillo Berthier, a sociologist with the National Autonomous University of Mexico. “It’s difficult to conceive of a new PRI with such old practices or a society that can liberate itself from these structures,” he says. While it's clear that a larger sector of society than ever before is alert and prepared to actively check the PRI's power, it's also true that many Mexicans are less concerned about power structures than they are with the government's ability to stimulate job creation and make the country safer. The theme of the “old days” is one of the strongest takeaways of the 2012 race. Adriana Romo, who works as an administrator in Mexico, sums up the national zeitgeist: “I want this country to be what it was years ago, the Mexico of 20 or 30 years ago.